Julie has been our groomer for the last twenty years. 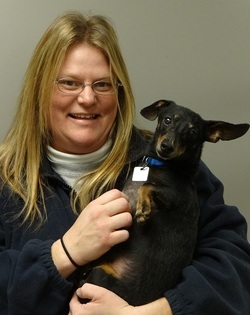 Along with beautifying our patients, Julie also is the manager of the kennel staff. She and her husband live on a small acreage hobby farm and raise beef cattle. Julie enjoys the company of her many relatives and friends, especially while watching Packer games. She has 4 cats, Rudy, Allie, Americas and Alex. Nikki works in the kennels at Westgate. She enjoys spending time with her son Kaden, husband Sam, and Sam's son Kyle. She has four dogs: Onyx, a Golden Lab mix, Dixie, a Miniature Dachshund, Gauge, a German Shorthair Pointer and Titan, a German Shepherd. Alaina joined the team in July of 2018. She is a senior at Memorial High School and plans to pursue a career as a Veterinarian. Alaina has one dog, Tessa, two cats, Merlot and Wren, chickens, guinea hens and a crested gecko named Frank. In her spare time, Alaina enjoys pampering her car, paddleboarding, drawing and spending time outdoors.